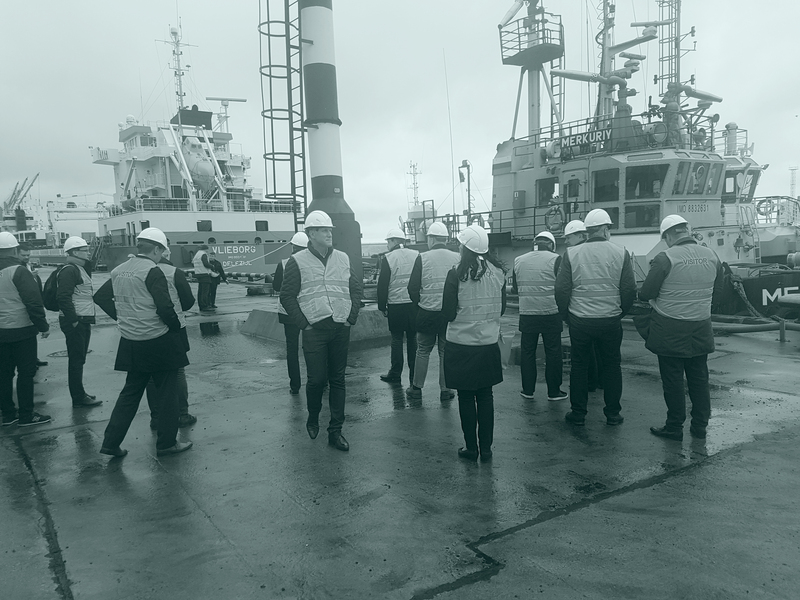 On 10th November, 2018, 20 participants from Baltic ports gathered at the Port of Ust-Luga, Russia, for a tour of the premises. The study tour, organized by the BPO in cooperation with one of its members, the Commercial Sea Port of Ust-Luga, was a perfect opportunity to experience first-hand the operations of what is set to be the largest port in Russia and Eastern Europe. The Port of Ust-Luga , situated on the southern coast of the Gulf of Finland, approximately 100 km west off St Petersburg, recently became the largest port in the Baltic Sea. Port of Ust-Luga consists of several terminals dedicated to handling liquid and bulk cargo as well as general cargo and containers. It is the main export route for natural resources from Russia, including oil, gas and coal. In 2017, Port of Ust-Luga handled 103.3 mln t of cargo, which translates into a yearly growth of 11%. The visit started with a visit to the Commercial Sea Port of Ust-Luga - a company that operates on the general and bulk cargo terminal as well as the ro-ro terminal. During a short presentation, Oleg Dekhtyar, Deputy General Director for Commercial Affairs at the JSC Sea Commercial Port of Ust-Luga, explained that, following the market trends, the port is handling growing volumes of coal and fertilizers. This year, the company will handle approximately 6 mln t of coal in total. Future development plans include new bulk cargo handling facilities and a petro-chemical cluster to be situated in the near vicinity of the port. Afterwards, the gathered participants set out on a tug boat tour to study the port from the waterside. Participants were able to observe directly how busy the port gets, with many ships mooring at its berths. The delegates also identified free space, which will allow for further development of the Port of Ust-Luga. LNG export and fertilizer terminals are among the new, planned investments. With their strength renewed during a brief lunch, the participants once again headed out, this time to visit the Marshalling Yard of the Ust-Luga Railway station, equipped with a state of the art operational centre. It is the most modern rail station in Europe, boasting 25 sidetracks located in the vicinity of the Port of Ust-Luga and provides the possibility to sort an average of 3250 rail cars per day. The number is set to increase to 5000 in the future. The yard is fully automated, with a system to move wagons and set-up a train without a need to maneuver the locomotives. Last year’s cargo turnover of the ULU Railway station reached 68,4 mln t. The railway is the main way to transport cargo from far destinations in Russia towards Port of Ust-Luga and thus crucial for its development. The trip was very well received and served the highly important purpose of bringing together different parties from around the maritime community. Exchange of experience and knowledge remain one of the key aspects of BPO’s task.